Short Bio: Degree in Biology from the University of Porto, Master’s Degree in Environmental Sciences from the University of Minho and Doctorate in Biology from the University of Aveiro. He has developed research on ecology and conservation of carnivores (Iberian Lynx, Jaguar, Puma, Gian Otter) in Portugal, Brazil and Bolivia. 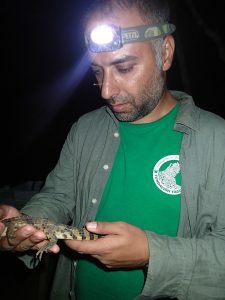 He has developed his postdoctoral work in science communication together with the Museum of Natural History of Maputo (Mozambique). Within this project, in collaboration with other institutions, it has developed exhibitions, videos, books and other informative materials that strengthen the museum’s educational role. He is currently working with ACEAA-Conservación Amazónica on aspects of wildlife management and conservation, with a focus on monitoring and conflict resolution between humans and wildlife. Abstract: The northwest of the Bolivian Amazon continues to preserve vast tracks of primary Amazonian rainforest and at the same time shelters more than 110 000 people living in a couple of urban settlements and several small communities. The socio-ecological system where these communities are living depends intensively of the sustainable use of natural resources (manly Brazil nut). ACEAA has been working in several areas within this region not only to improve people’s livelihood but also to preserve biodiversity. In the last 15 years there has been an increase of threats (Roads, Gas&Oil exploration, Mining) that can severely affect this socio-ecological system at different levels. ACEAA and its local partners have designed a Monitoring Program that aims to support decision-making.